After finishing her studies at the Stockholm University in 2004 – or rather the year before – she made her debut at Vadstena in the title part of Carl Unander-Scharin’s opera Brygitta and after several roles in lyric or lirico spinto parts she gradually took on more dramatic roles and since her debut as Senta in Der fliegende Holländer in Riga in 2007 she has concentrated a lot on Wagner. I saw her as Irene in Rienzi in Riga some years ago but also as Giorgetta in Il tabarro in Helsinki and just a little more than a year ago as Chrysothemis in Patrice Chéreau’s production of Elektra. Rienzi is not exactly standard repertoire but even less so is the very early Die Feen, which Wagner composed when he was 20. He was then strongly under the influence of Carl Maria von Weber, to some extent also Beethoven. Nobody who hypothetically would have heard it then could have imagined that within a couple of decades the young Kapellmeister in Würzburg would revolutionise the way of composing operas, but few if any heard it. It was not played until five years after Wagner’s death in Munich, and the conductor was Richard Strauss. The aria sung on the present disc has its merits, it’s beautiful and it’s a good idea to have it as the first of nine excerpts from Wagner operas, presented in chronological order to demonstrate the development of the composer. To have it preceded by the only non-Wagnerian piece, Beethoven’s Abscheulicher! Wo eilst du hin? is also clever to give a hint of the roots for Wagner’s way to greatness. This powerful recitative, followed by the beautiful prayer-like Komm, Hoffnung is one of the greatest dramatic utterances in German opera before Wagner, and Elisabet Strid is great. She has an expansive voice for the outbreaks of wrath and also the capacity to spin a smooth legato in the aria proper. Senta’s ballade from Der fliegende Holländer has heft but it seems that the voice is a little weak in the lowest register. Elisabeth’s dramatic and jubilant entrance song from Tannhäuser has a lot of glamour, while her prayer, Allmächt’ge Jungfrau with good contribution from the male chorus, is properly reverential. 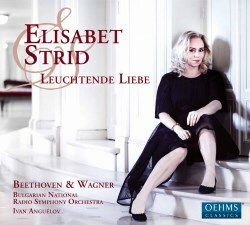 Elsa’s Einsam in trüben Tagen is another prayer, well sung. In the theatre Isolde’s Mild und leise is a real trial of strength, after nearly five hours of high-octane singing. In the recording studio one can attack this Everest fresh and rested, and this is one of the best scenes on the disc. For the concluding part of the disc we visit the world of Der Ring des Nibelungen. In the first act of Die Walküre we meet Sieglinde in the two bleeding chunks that traditionally are recorded. They are basically unsatisfactory – for maximum dramatic effect one needs the tenor as well – but anyway Der Männer Sippe begins as early as Schläfst du, Gast?, which makes a little more sense. The singing is excellent – she is well inside the role, and Du bist der Lenz – which is a direct answer to Siegmund’s spring song, Winterstürme wichen dem Wonnemond – is sung with all the ecstasy needed. Brünnhilde’s Ewig war ich from Siegfried rounds off an attractive disc with the latest link in the long chain of outstanding Scandinavian Wagner singers that extends back to the beginning of the previous century. Ivan Anguélov’s discography is extensive and he has conducted a large number of singer portraits for Oehms, including a couple of award-winning Wagner recitals. The recording is satisfying and the only black mark is the lack of texts.